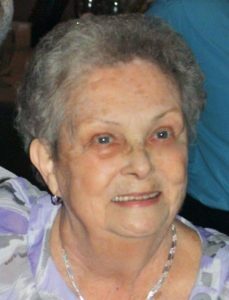 Anne M. Carney, 87, of Oswego died Friday November 2, 2018 in St. Luke Health Service, Oswego. She was born in Oswego the daughter of the late Harry and Mary (Budd) Gallagher. Mrs. Carney enjoyed sewing, and she was a past member of the Marine Museum. Mrs. Carney was predeceased by her husband William E. Carney, daughter Julie DeGroff, and son-in-law Joe Scanlon, predeceased by siblings Edward Gallagher, and Mary Jane O’Toole. She was a very devoted mother, and grandmother. Mrs. Carney is survived by her children Cathy (Dave) Goettsch of CA, William (Lisa) Carney of Oswego, Patti Scanlon of Oswego, Maureen Carney of Oswego, Monica (Dale MacDonald) Carney of Fulton, Theresa (Nate Johndrew) Carney of Oswego, John (Danielle Pasco Ault) Carney of Liverpool, 17 grandchildren, 9 great grandchildren, one great grandchild, and one great great grandchild. Funeral services will be Wednesday November 7, 2018 at 10:00 AM in St. Joseph Church. Burial will be in St. Peter’s Cemetery. Calling hours will be Tuesday November 6, 2018 from 4:00 to 6:00 PM at the Sugar & Scanlon Funeral Home, 147 W. 4th. St. Oswego. As a Pet Therapy Team, my Yellow Labrador, Ody, always looked forward to visiting with Ann. She was such a magical lady, and both Ody and I will miss her greatly. Our loss is heaven’s gain. Her passing has left a huge hole in my heart. She was a great lady and a dear friend. My thoughts and prayers are with you all. Thinking of you with sympathy. May the fond and fun memories you share of your mom and grandmother warm your hearts in days to come.